This game, in addition to cribbage (thanks English heritage! ), were my constant companions as a child. These games also provided an incredibly strong foundation for math facts. I didn’t recognize the math benefits as a kid, but now I realize just how greatly games boosted my simple addition skills, and try to employ them in my own children’s lives as much as possible. I loved pyramid because it was a single person game, but not boring like solitaire. Seriously. I cannot comprehend how people enjoy solitaire forever. You’ll need a standard deck of cards for pyramid. The object of the game is to remove cards in the pyramid by “making 13”. You make 13 by removing two cards at a time which, added together, equal 13. Set up your cards like this. 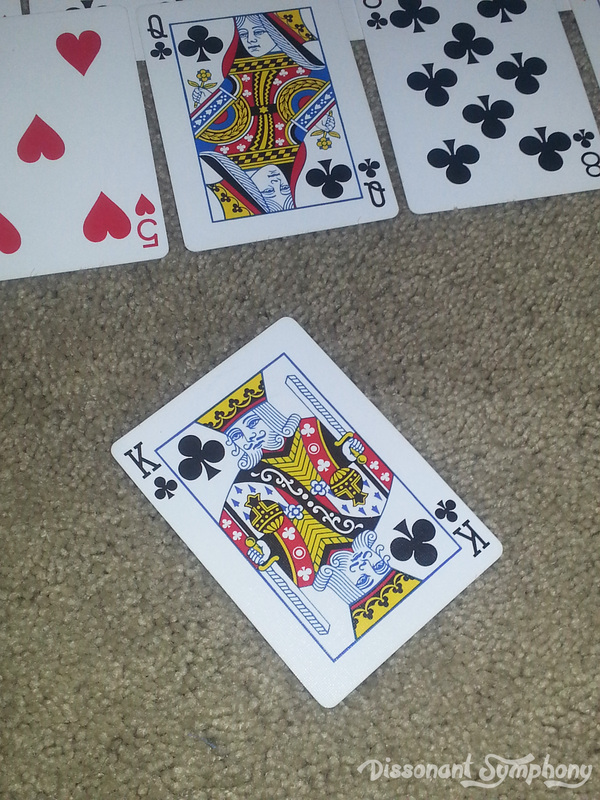 One card is dealt face up at the top of the playing area, then two cards beneath and partially covering it, then three beneath them, and so on completing with a row of seven cards for a total of 28 cards dealt. 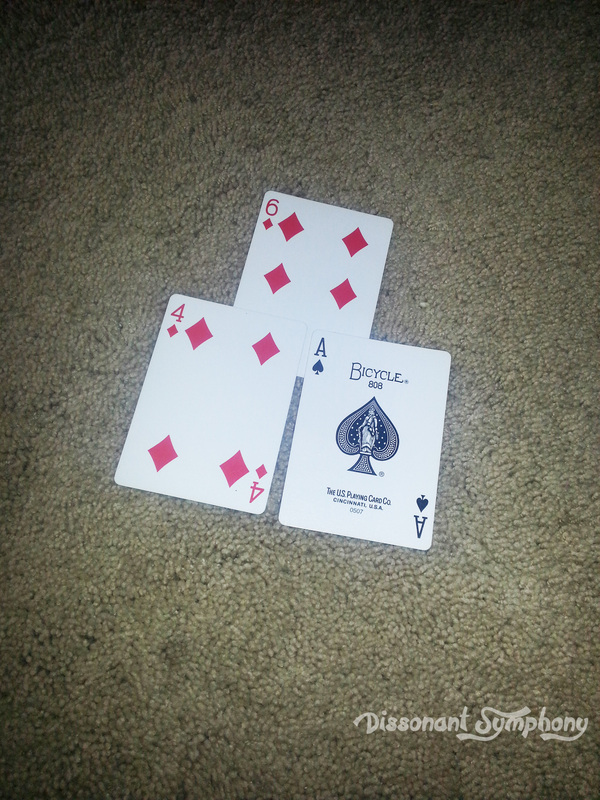 The remaining cards are placed to the side face down. 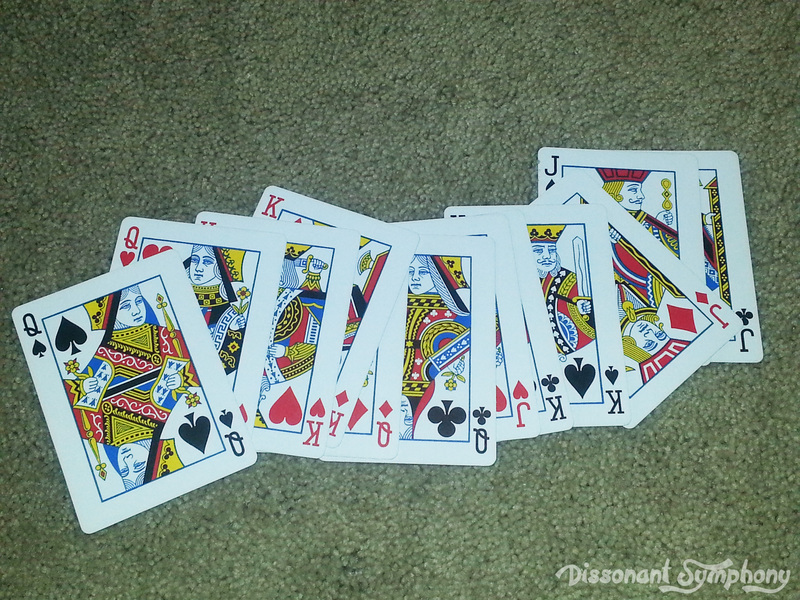 Play begins by matching two cards to equal 13. Like the 5 and 8 on my bottom row. Since you can only match cards that aren’t covered by another card, I couldn’t match the queen and ace until I’d removed the 5 and 8. Now that the first pair is gone, the only thing covering the ace is the queen it goes with, so I could match those second. You can also remove any uncovered kings because those equal 13 all by themselves. Play continues until you have nothing you can match. That’s where your cards on the side come in. 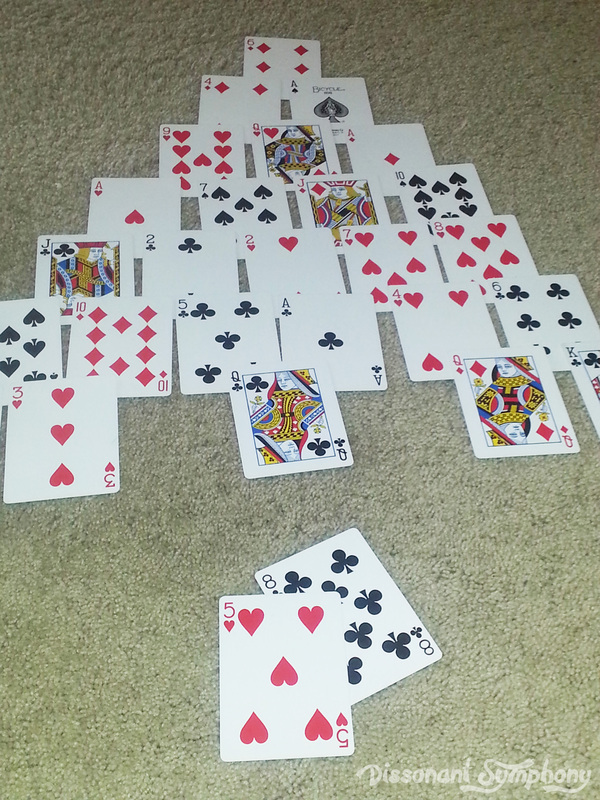 Flip one at a time face up to try to match with the remaining cards in your pyramid. For an extra challenge, flip three at a time, but since I’m using this as a math game, I want as many opportunities to make matches as possible. The goal is to clear the entire pyramid. Any cards left in the pyramid count as points against you. 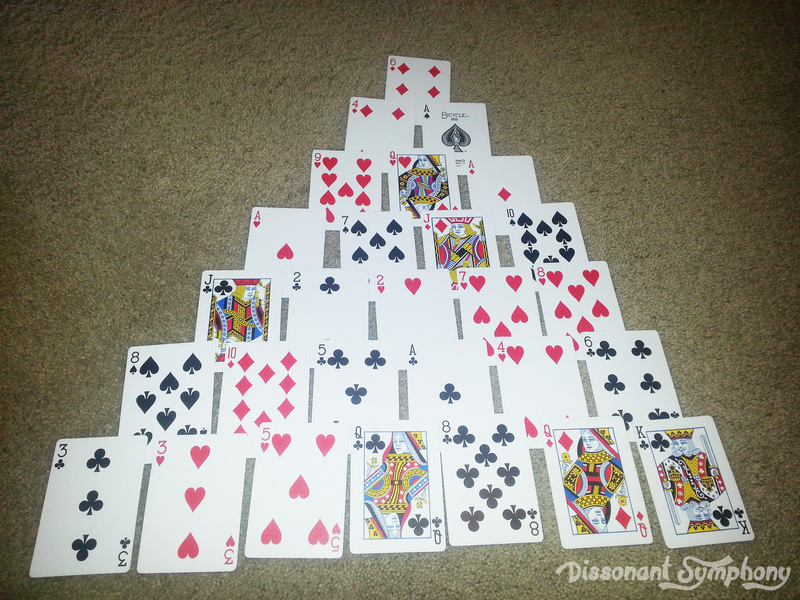 For example, if I had my 4, 6, and ace (top two rows of my pyramid) remaining, my score would be 11. 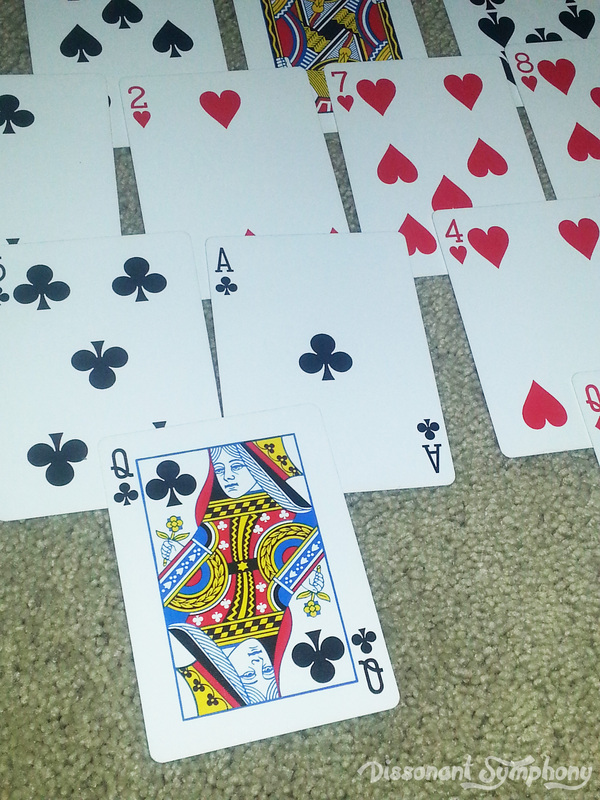 For play with younger kids, remove all the face cards (except aces) and play with the goal number of 10. This is a wonderful way to really cement those all important sum of ten facts. You can play competing games with as many kids as you have decks of cards for. My son loves trying to beat me. No. We aren’t Canadian. Brought those cards back from a trip with my sisters to our neighbor up north. My munchkins both LOVE playing games with their maple leaf cards. 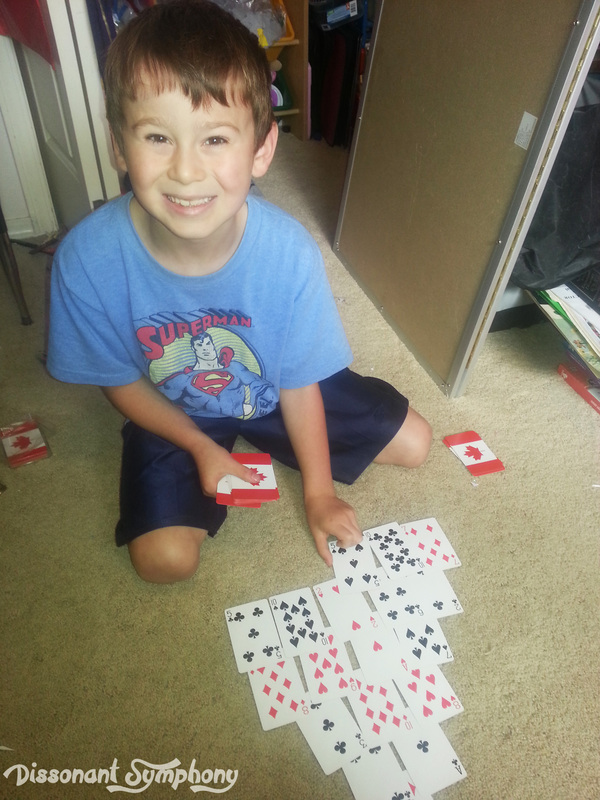 Do you have any favorite math games with playing cards? Feel free to leave a suggestion in the comments! I’m always looking for new games to play!